PetsConnect! is pleased to be enrolled in the Kuranda Bed program! 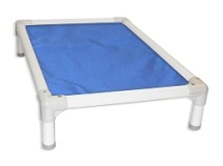 These beds are durable, long lasting, can be sanitized, can be used inside and outside and are great for cats. kittens, dogs and puppies. 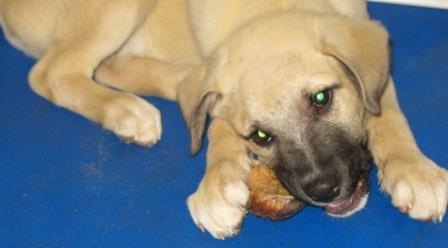 Here is Hudson laying on a Kuranda bed enjoying a bone. Actually, it’s really more like camped out on the Kuranda bed hoping none of his siblings catch on to this wonderful treat he has acquired! The frame is made of hard white plastic, the bed part is a thick vinyl and available in a variety of colors. Kuranda patented design provides firm, even support no pillow or cushion can match AND they are protected from dogs that chew! This bed’s unique design tucks the fabric panel inside a PVC frame – safely protected from chewing dogs. 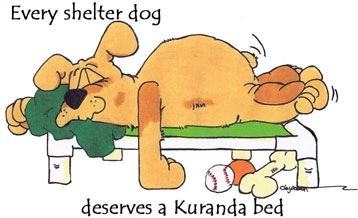 The Kuranda bed comes in six sizes. They are Lightweight, non-corrosive, ideal for outdoor or indoor use. Available in Cordura, Vinyl Weave, Ballistic nylon or our most durable 40 oz vinyl. Why not consider donating a Kuranda Bed for the furry friends here at PetsConnect? My Story By Opie-Part Two.